Discussion in 'Release Notes (Beta Versions)' started by avatar, Jan 23, 2014. Finally I am ready to announce 5.9 beta release . Version 5.9 brings a large number of changes and fixes in Adguard. Since the program was created we have received many requests from users for implementing the “Parental Control” in it. Many parents found Adguard helpful, because a child didn’t see inappropriate advertising. Now, in addition to blocking such "adult" ads, we have added new features to protect your child. You can protect the program and its settings with a password. Without knowing the password, disabling of Adguard is impossible. SafeSearch excludes adult resources from the search results on popular search engines (Yandex, Google, Rambler). If this option is enabled, Adguard will prohibit download of any executable (.exe) files to your computer. This will protect your child from installation of any programs. The sensitivity level determines what sites your child will have access to. The higher the level, the fewer sites will be available. In version 5.9 you can install extensions (user scripts). Their mission is extension of the functionality of websites. How exactly will the functionality be expanded depends on the user script. This can be a pop-up blocking, flash queries blocking, possibility of downloading music and video from social networks and much, much more. Adguard comes with a set of our own extensions. You can find and install an interesting extension on userscript.org or even write it by yourself. At the moment Adguard is the only program that allows to use user scripts in any browser. We plan to bundle one more extension to the next beta version. It will be our FlashBlock implementation. In this version Adguard can block most of the Video ads. We faced a problem in previous versions: simple video ads blocking can cause video player shutdown. That’s why we sometimes had to add online movie sites in exclusion list. Now Adguard can block this type of ads correctly and without problems. The thing is that the majority of video advertising is subject to the standards of "the International Bureau of Advertising" (iab.net). 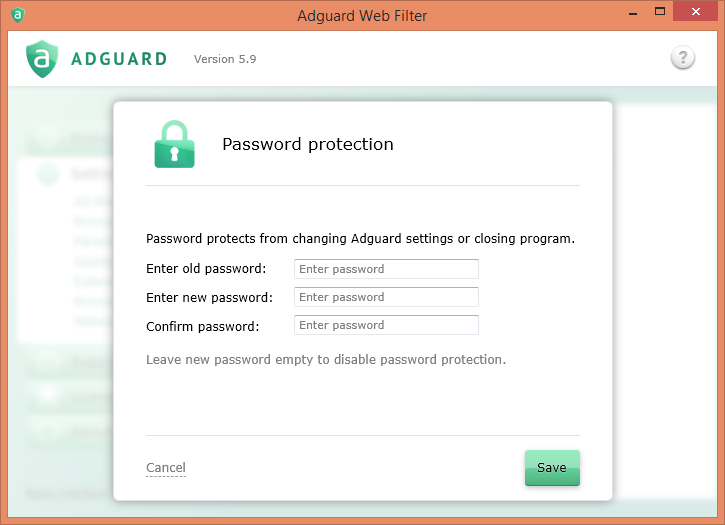 In version 5.9 Adguard learned to recognize and convert queries that use these standards. Will test this extensively today, especially the userscripts feature. I can now dump Greasemonkey and Tampermonkey, yay! Hmm, we will test it one more time. Everything was ok when we tested it last time. Use Firefox/Chrome with KIS2014 and the WFP driver and leave https://news.google.com/ open for awhile - sooner or later as it automatically refreshes itself it'll throw connection errors in Firefox or blank/partially loaded pages in Chrome. It'll also cause that same site to load slower in Chrome too. I should also point out that https://news.google.com/ is my homepage too. Facebook appears screwed up (I'm guessing it's broken by the filters). EDIT: Looks like parental control and/or the WFP driver is responsible. 1. Set https://news.google.com/ as my home page. Probably best to use the US English version of the site like I use. Also probably a good idea to have a US English Google account logged in as well for the sake of testing. 2. Close the browsers and reopen them. If the page loads fine, keep refreshes until any of the following issue(s) described below occur. - https://news.google.com/ loads very slowly when Adguard, the WFP driver and Kaspersky Internet Security 2014 is being used (mainly Chrome is affected here) when the site is set to my home page. It seems the issue(s) only affect HTTPS sites. - In Chrome the page(s) from Google domains randomly either don't load at all (blank page) or partially load (like in the screenshot which will be attached to this post). - In Firefox the page(s) will randomly give off a secure connection failed error that says SSL received a record that exceeded the maximum permissible length (Error code: ssl_error_rx_record_too_long). - In Firefox if the page loads correctly and I leave the page open for an extended period of time, eventually it'll stop working while giving the above error. Reason for this is Google News updates itself periodically to refresh the news. I don't believe it's just Google News either - I've noticed the above issues on other Google domains as well. And there's always the chance the issue(s) described above affect other sites so I'll be doing some testing with HTTPS sites. Screenshots time! Notice how only the top of the page loaded? 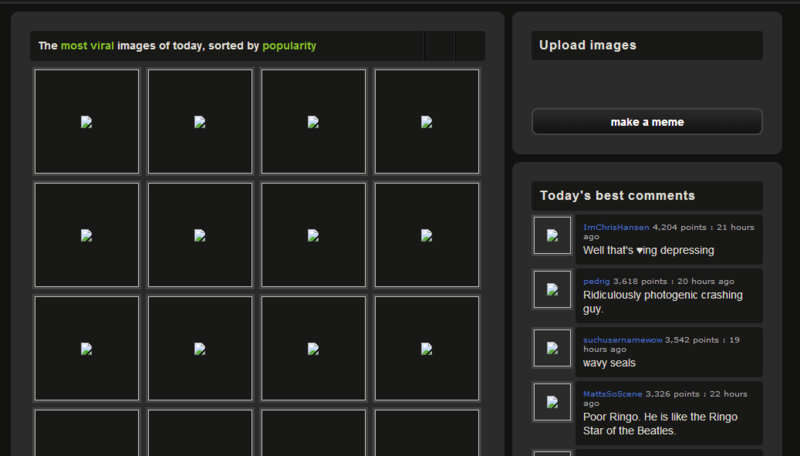 There's other examples like only half of the page loaded, but I didn't get a screenshot of that. If needed though, I can! I believe this screenshot shows a clue to the possible cause of the issue. Since I don't believe Chrome can show errors like this, it either doesn't load a page completely or just blanks out. - in firefox, chrome and maxthon in imgur.com after inputting the password to access the page some page elements are missing. internet explorer works as it should in this case. - also i've found that having the same password to lock down Adguard and Parental controls is confusing in its current implementation i.e it is not clear that the password entered when you enable "Protect Adguard with password" option also applies to parental control. having the password entry option in the Parental Control section is one potential solution. pressing save without inputting anything will crash Adguard. userscript support is looking good, kudos on a job well done. Also clicking Disable parental control by a user account under Protection > Parental Control doesn't toggle or disable the feature. However clicking the Enable all or Disable all buttons toggles it correctly. FYI, I only have one user account on Windows. Great, thank you for the bug reports! partially loads or in Firefox's case it gives off a connection error. Are you getting it with WFP driver only? you enable "Protect Adguard with password" option also applies to parental control. having the password entry option in the Parental Control section is one potential solution. Why? It is harder to remember two different passwords. unblock the web sites blocked by Parental Control. Yep. After changing to the TDI driver and rebooting the pages work fine. what i meant was relocating the password entry field to the Parental Control section(my previous wording was confusing, ironically) having it there makes more sense as it is there that the password is mostly used. Password protection is program-wide now - does not for Parental Control only. But maybe you are right and it should be enabled if parental control is enabled only. the images on the product listings aren't visible. the only way to make them appear is by right clicking on them and selecting "View Image"(<-- as an example in firefox) after which the Access Denied page appears and you can input the parental control password. after this images load as normal. - When right clicking on the system tray icon > Adguard Assistant > Use Adguard Assistant doesn't do anything anymore (doesn't enable or disable the feature). This is most likely due to the Assistant change to a Extension. - Add an Extensions menu item to the right click menu (system tray icon) that shows installed extensions and allows us to toggle (enable/disable) them without going into the options. - Create a new extension that intercepts .user.js files in all browsers prompting the user to install them as an extension in Adguard. - The specific browser enable/disable of plugins so we can select which browser(s) we want extensions to use for each specific userscript. - Button next to the enable/disable toggle to open/edit the userscript/extension in the default text editor with another button to refresh the extensions to detect/use the changes made externally. - Adguard Chrome/Firefox extension binary support with the main Adguard program. This would be useful for those of us whom want to use the extension (Chrome, soon Firefox) and have all changes synced to the main program. It should be possible to have a binary element for this - LastPass has binary plugin support between browser extensions and the running program itself. - Adguard Cloud Sync for accounts, allowing us to upload our user filter rules (and maybe settings) to a server, and allow us to download/sync the filters on new installs. This sync could be extended to the Chrome/Firefox extensions - would be extremely handy on Linux and Mac! - Option inside the program to restart the service, the main program and filtering. Can come in handy for those situations when filtering (especially HTTPS filtering) fails. - A button in the extended/advanced options to make Adguard restart in debug mode within the program, so we don't have to manually close and hunt down the shortcut. Maybe an option via the system tray icon too? - Is the forum going to get the new Adguard banner at the top, along with the new favicon the main site has? - I'm assuming 6.0 will have the new Adguard icons/banners? - Is there anything that can be done to speed up the loading of the YouTube Center Developer Build userscript after we've downloaded it? Something like caching it or something? I notice when going to YouTube the layout is left-aligned then a few seconds later the userscript kicks in. I realize the userscript is over 2.6MB so that's why I was thinking caching or something unless an update is available. - We will change the way Parental Control is set up now. It is too complex, you need to go to advanced interface every time. So we'll add some kind of "wizard" that helps to set parental control up. - We will change password protection. It won't be application-wide -- for Parental Control only. Still getting a random SSL connection error when refreshing the page multiple times in Firefox on https://news.google.com/ - SSL received a record with an incorrect Message Authentication Code (Error code: ssl_error_bad_mac_read). There's a second SSL error randomly occurring in Firefox on https://news.google.com/ when refreshing the page multiple times until it happens. SSL received a record that exceeded the maximum permissible length (Error code: ssl_error_rx_record_too_long). EDIT: Did a complete clean install, still randomly happens BUT WFP is way, way more stable with Kaspersky now other than those errors on Google domains. 1. Extensions support is really too much . Browsers provide API we cannot implement. 2. Cloud Sync -- this is great, we'll think about it. 3. Restart the service -- why? protection stop/start does the same. 3. It is cached. If you open developer console in browser - your should see 304 Not Modified response for this userscript request. Fair enough, but thinking about it more the cloud sync idea actually would provide the same thing, more-or-less. Oh yes, this would be amazing indeed. I could install the browser extensions in Chrome/Firefox on both Mac and Linux and have my user filters available to me... and any new filters I create would be synced back to the main Adguard program on Windows! How amazing is that?!? Since the first beta, the issue I noticed where SSL filtering would fail completely in all browsers unless forcefully restarting the program and service seems to be gone, so this idea is moot at this point. - Debug Log option within the program itself so we can view/export logs in realtime. This would be greatly helpful in hunting down any issues as they happen. You're right, hmmm. It's probably the script itself then why there's a delay before it kicks in. Youtube Center is rather sophisticated. It detects that it is executed not from extension (tampermonkey) and changes it's behavior. This could cause this issue. Also we always execute scripts at document end. We'll try to move this script to document start and we will see what happen. There's a Greasemonkey function available for this, @run-at which the value is set to document-start in the YouTube Center script (document-end is the other value available for @run-at). Perhaps this function can be supported for scripts that specify it? how about adding stylish feature ? Most Stylish scripts already work as userscripts.